The Agilent E4980A Precision LCR Meter offers the highest accuracy and repeatability from 20 Hz to 2 MHz, and supports LAN, USB, and GPIB PC connectivity. Unlike competing LCRs, the E4980A offers fast measurement speed and outstanding performance at both low and high impedance. 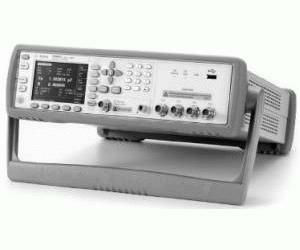 Compared with the Agilent 4284A LCR, the E4980A provides measurements 5 times faster, a modern PC interface, compact size and additional features to further enhance your design and test productivity.